The shower of musical notes falling as stars from the ancient instrument, are the centre of that spark, and the whole point of the painting. 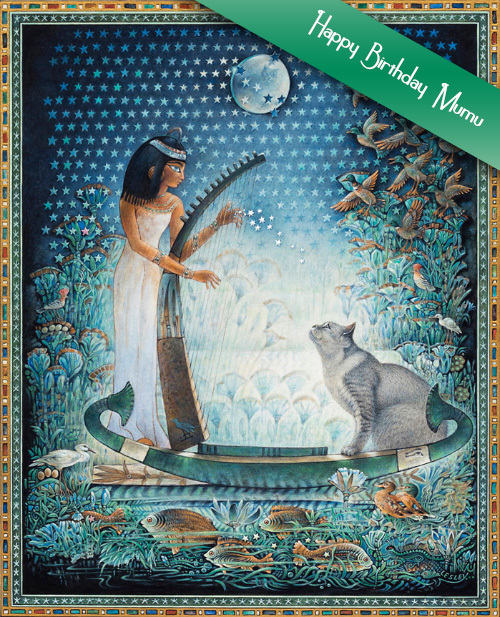 This painting is my special tribute to Mumu for the occasion of her Birthday (a girl never divulges her age). I visualised her with music, and in an ancient Egyptian setting. The work took many weeks to materialise, through endless sketches and varying formats, until finally this arrived, which is near to my original spark, which was that it had to involve lots of stars, and embody the spirit of 'music and mystery'. The shower of musical notes falling as stars from the ancient instrument, are the centre of that spark, and the whole point of the painting. These lines from Tennyson's poem The Lotus Eaters, have always been amongst my favourite poetical quotations. I learned the poem at school by heart, it is still in my head, inspiring me to this day. Appropriate to remember them again for this scene; the Music, the Lotus, the perfect place to be. One glance at this painting, and my Grand Daughter Alice immediately saw, and understood the inspiration. That magic moment between us was as if a star had been born. I said to her that I would record this moment by concealing an A for her somewhere in the painting. Her delight was my reward. I have kept my promise, a hieroglyphic A is there for her to find. (The pink star is for her sister Rebecca). From her lunar position, Mumu's mother Bella affectionately looks down on her daughter. For just one moment there is a woman on the Moon.